Type of Object Unknown metal (probably brass or other alloy). Bead Size 2 mm diameter. See picture with penny for size comparison. 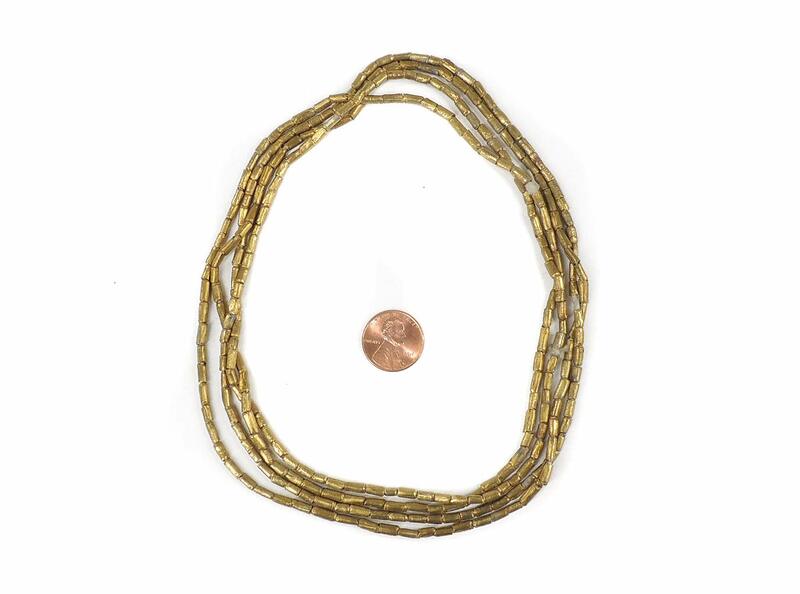 Strand Length 28 inches (including string/raffia). Picture is an example. Yours will be similar. Additional information: Africa has been home to an active metalworking industry for 6,000 years, reaching back to the ancient Nubians and Egyptians who crafted artifacts in gold and copper. Ironworking was introduced by the Phoenicians around 800 BCE, and spread gradually across the continent to the Kingdom of Axum, then west to the Nok civilization and along the Atlantic coast. The metal was used to produce weapons, tools, amulets and other magical objects, and blacksmiths came to occupy a special position in society: respected and feared for their powers of metamorphosis. To this day, many West Africans will not look a blacksmith directly in the eye. Iron was not the only metal manipulated and shaped by the skilled hands of African metalworkers. The Ashanti kingdom in present-day Ghana was famous for its abundant gold reserves, and the Ashanti people crowned their king on a sacred golden stool said to have floated down from the heavens. The nomadic Tuareg traversing the Sahara region specialized in silver jewelry like the Agadez cross pendants which were passed down from father to son with the words, “I give you the four corners of the world, because one cannot know where one will die.” In Ethiopia, triangular or crescent-shaped telsum amulets, mergaf pendants with their dangling conical bells, Coptic crosses, and strands of hollow prayer beads were all crafted in silver. 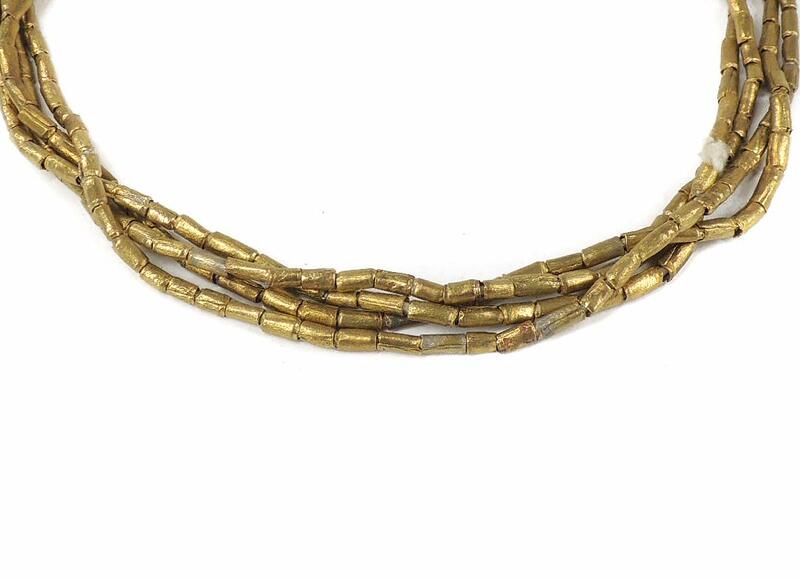 A spectacular range of brass beads and pendants were (and continue to be) produced across the continent, most notably in the form of Yoruba raised dot beads made from gilded brass, the small anvil-shaped pendants known as "Igbo bugs" popular among the Fulani, and the intricately decorated tubular beads worn in the hair of Wodaabe women. 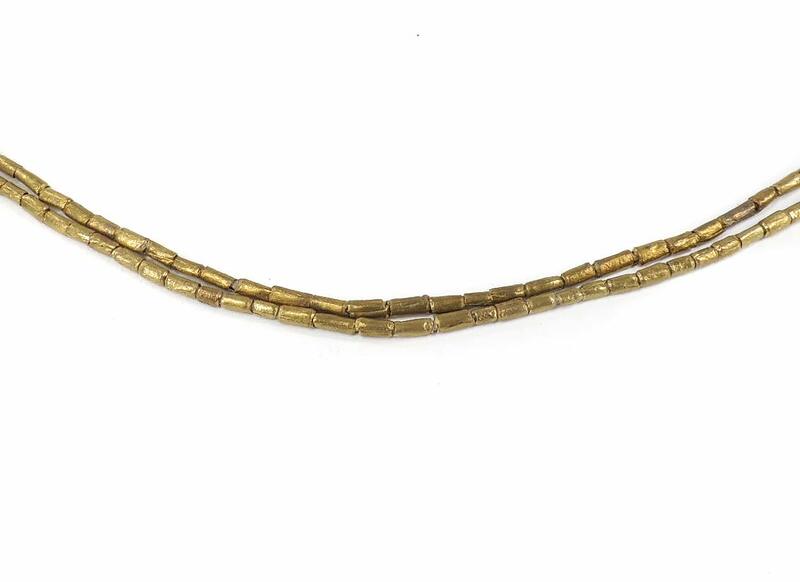 Supplemented by copper and aluminum, the tradition of metalworking in Africa is very much alive, as evidenced by beads and jewelry like the item for sale here. Adapted from our comprehensive guide to African-made beads, African Beads: Jewels of a Continent, hardcover, 216 pages, 163 color photographs, available from Africa Direct.